Birthdays mean the choosing of names (well, for the actual birthday anyway), the assigning of social security numbers, etc. Why not find out about another ID before my birthday—MyCeliacID? Have you heard of this testing by Prometheus Labs? It’s an “at home,” saliva-based celiac genetic testing. The cost is $329 (less any discounts; codes that offer $80 savings are widely available). It takes all of 15 minutes to complete and then you drop off the package to a FedEx site/drop-off box—that’s it. As I’ve shared before, I have never been diagnosed celiac. Traditional celiac testing was not conducted, per my doctor’s guidance. I’ve discussed the why’s on that topic before and we can talk about them again in the future, but for right now, I just want to share MyCeliacID. You probably have many other questions about this testing. All of them should be answered in my report below. If not, there are additional links included; e.g., FAQs. Why did I take the test? Well, other than the annual “reflections” I often pursue on my birthday, I had health care flexible spending account money to expend, plus I was curious. I also thought I could share the experience as well as any insight gained with my gfe readers and support group members. Please read the information in my report (key data is bolded, with my actual genetic results shown in red) and give me your thoughts. Your risk for developing celiac disease is very high. Patients with very high risk are 16 times as likely to develop celiac disease compared to all at risk individuals. You possess a combination of genes associated with risk for celiac disease. This does not mean you have celiac disease or ever will have celiac disease. Only a doctor can make a diagnosis for celiac disease. Diagnosis of celiac disease requires a small bowel biopsy for confirmation. If you have symptoms associated with celiac disease, please see your doctor and share your MyCeliacID test result. and/or DQ8, and is the most detailed genetic test commercially available for celiac disease. Having the genes associated with celiac disease is one factor for developing celiac disease. There are other factors that play a role. It is important to remember that only a doctor or other qualified medical professional can make a diagnosis of celiac disease using the results of your MyCeliacID test with other clinical and laboratory findings. This means your doctor may order other tests and conduct further examination. ● Do you have a family history of celiac disease? If so, you should consult your doctor and share your MyCeliacID test result. ● Do you have symptoms associated with celiac disease like bloating, diarrhea, anemia, infertility, recurrent miscarriage, short stature, weight loss, osteoporosis, vitamin deficiencies, dental enamel defects and delayed puberty? All of these are common celiac disease symptoms. If you have any of these talk to your doctor and share your MyCeliacID result. While you’ve tested positive for the genes associated with celiac disease, only a doctor or other qualified medical professional can make a diagnosis. Unlike other conditions, celiac disease does not require surgery or a medication regimen. Most people see improvement of symptoms soon after they start eating a gluten-free diet. Food companies are now making a growing number of gluten-free options easily available. A gluten-free diet is a lifelong diet which is used to treat celiac disease. This diet should only be undertaken after careful evaluation by your doctor. For help and information about gluten-free eating, see Gluten-Free Diet Basics. Celiac disease runs in families, so it’s important to talk with your family members about your tests results. Identifying risk is important for early detection and preventing symptoms and intestinal damage. There are many support organizations with extensive educational resources. Empower yourself by learning more about celiac disease and the gluten-free diet. For answers to other questions you might have, go to Gluten-Free Diet Basics, MyCeliacID FAQs, or contact [email protected]. Results reviewed by the Laboratory Medical Director. Information regarding genetic counseling is available through our website at www.MyCeliacID.com. The methodology for this test was validated at Prometheus. LiPA, Innogenetics, uses high-resolution sequence specific oligonucleotide (SSOP) with 2 separate multiplexed PCR amplifications and 72 probe hybridizations for the detection of HLA DQ2 DQ8 allelic variants. This test was developed and its performance characteristics determined by Prometheus Laboratories Inc. It has not been cleared or approved by the U.S. Food and Drug Administration. This laboratory is certified under the Clinical Laboratory Improvement Amendments of 1988 (CLIA-88) as qualified to perform high complexity clinical laboratory testing. PROMETHEUS, the Link Design, and MyCeliacID are registered trademarks or trademarks of Prometheus Laboratories Inc. Copyright ©2010 Prometheus Laboratories Inc. All Rights Reserved. Prometheus Laboratories Inc. is accredited by the College of American Pathologists. Looking at MyCeliacID, did I make the right choice to follow my doctor’s advice and go gluten free 7 years ago? What do you think? If you eat gluten free, but are not diagnosed celiac, is this something you are interested in? (FYI–I am in no way associated with MyCeliacID or Prometheus Labs. I’m just a customer.) 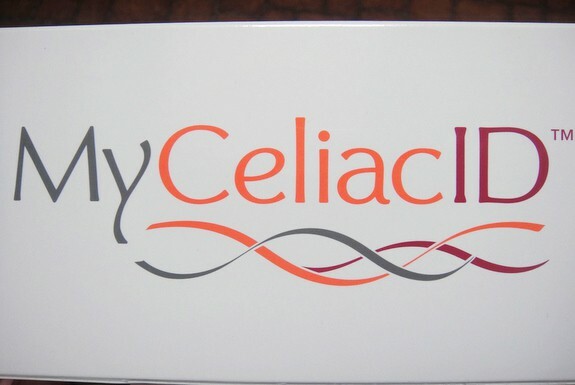 Or have you already had genetic testing for celiac? There’s so much to discuss on the topic of celiac testing (and testing for non-celiac issues) … what compels one to get tested after going gluten free, how far one is willing to go with testing after going gluten free (i.e., that nasty term—gluten challenge), etc., but I thought I’d start with this info. Again, I’m curious to get everyone’s inputs. This is just Part I. I’ll be back with a follow up post (or posts) in the near future. Hubby, the youngest and I all did the test last year to finally answer who were the celiacs in our house besides the eldest who had the gold standard diagnosis and tests. We blew it when we all went gluten free with him and couldn’t do a blood test when we all got so sick attempting a gluten challenge. Good counseling at the time of the eldest’s diagnosis would have saved us a lot of hassle. Youngest came out positive very high risk, I was positive high risk and hubby was negative with some of the DNA involved in celiac. He appears to be intolerant and I believe his father and grandfather were celiac. I found the tests invaluable to our family. I live in Italy and did a blood test that said I was “genetically incapable of digesting gluten.” Since then I have gone gluten and lactose free and feel a lot better. I had no idea that anemia, infertility, miscarriage and late puberty were signs of celiac disease. I have had ALL of those but never made the connection. Hi saretta–Thanks for weighing in on this topic with your own experience with testing and symptoms. It still surprises me that testing is so different in different countries. As you may have noted in MyCeliacID, my results are clear to point out that these genes do not mean that I have celiac and to pursue it further and so forth. Here the thinking is one has the genes for celiac, but then there has to be a trigger for the body to see gluten as a foreign invader and not be able to digest gluten. I think looking at the genes and going from there would be a whole lot better. It would save so many from years of multiple health issues like you, I, and many others have experienced. I’m so sorry you suffered those, but grateful that you are feeling so much better! The book Dangerous Grains talks about hundreds of symptoms and conditions related to gluten. Shirley, I would be a perfect example of going gluten free without any Celiac diagnosis. After Conner’s diagnosis (and before my husband’s) I did the genetic testing as well to see if it was I that passed the gene on to Conner. I received the results that, although I did not have the actual Celiac Alleles, i did have an allele that puts me at large risk to gluten sensitivity. I have had a total of 3 miscarriages (w/the possibility of an undiagnosed 4th, according to my doctor). All of them were while I was still eating gluten. I had one before staying pregnant with Conner, and then 2 (or 3) before staying pregnant with my youngest. Some people said it was probably a coincidence, but I know how much better I was feeling once I was 100% gluten free ALL of the time. I know that my body was finally absorbing nutrients that it had probably been missing prior. I am sure that this is why, within 2 months of totally staying GF, I got (and stayed) pregnant with my second. Hi Kim–There are so many examples of those who go gluten free without a celiac diagnosis. The other part of the equation is the gluten sensitivity, and it’s nothing to take lightly, as you know and have shown. Dr. Scott Lewey thinks that folks can be even more ill with non-celiac gluten sensitivity than many of those with celiac. I personally know a lady who was in a wheelchair before she was diagnosed with gluten sensitivity. Now, she’s out of the wheelchair and is a thriving human being. I’m so glad you have two beautiful children, but my heart goes out to you on the miscarriages. So many are suffering those with no idea that gluten is likely to be the issue. The malabsorption issues are multisystem and are often attributed to a multitude of diagnoses instead of the real one. Thanks again for sharing your story, Kim. I’m so glad you think this post is a worthwhile way to spread the word. Yes, there can’t be enough of the spreading of the word! I’m just curious why you wouldn’t get an endoscopy and check your Transglutaminase level (IGA)? That is how I was diagnosed (The dr took one look at my duodenum and knew I had celiac but we did the blood work and biopsy to check). Hi Angela–I had been to many, many doctors over the years. Celiac was never ever mentioned. An endoscopy was never even mentioned. I got the dreaded IBS diagnosis and drugs for that problem, plus drugs and surgeries for others. I was pretty sick by the time that I found my doctor. Even though she herself is diagnosed celiac, she has little faith in the gold standard testing. In fact, Dr. Peter Green led a study a number of years ago, which showed that only about 70% of those who showed celiac via biopsy actually tested positive on the tTG test/blood panel. The biopsy had been done on these individuals anyway because the celiac symptoms were there. In addition, I’ve personally heard Dr. Fasano speak and say that about 40% of biopsies either are taken incorrectly and/or interpreted incorrectly. That was shortly after I was diagnosed so the rate may have improved, but standard celiac testing still leaves a lot to be desired. And, some folks will never ever developed celiac, but may be gravely ill from gluten sensitivity. Recent work by Dr. Guandalini at the U of Chicago has shown that there is damage from non-celiac gluten sensitivity. My doctor considered the still controversial Enterolab stool test to be the best measure for even the minimum of a gluten issue. I feel like the positive results from that test saved my life and I know a diagnosis from Enterolab has saved many others. I am so glad that you got your answers quickly and had an informed doctor, but for many it’s not anything close to being that straightforward. Thanks for adding to the discussion … it’s a big one! I’m sure you’d discussed that before but I appreciate you explaining it. Thanks! I went GF – by accident! I was doing a candida cleanse (which is GF) when i tried adding gluten back in, i got sick. But i had a hard time making myself stick to the diet. Eventually i went back on gluten & after 3 weeks (i couldn’t stand it any more) ran the blood tests – IgG etc. Did not show + but i’ll never know if that is because i didn’t wait 6 weeks or if i am just “gluten-sensitive” not celiac. I’m pretty committed to continuing GF at this point, because when i don’t i get sick more – sore throats, migraines, & much more pain. Hi Kathryn–You are not alone! Many find out they have gluten issues just by being on other gluten eliminating or restricting plans; e.g., a low-carb diet like Atkins or South Beach. When they stray or resume eating their normal diet, they have problems. Your symptoms are what many experience eating gluten (and really that’s a very large group of people), and what they can avoid when they stop eating gluten. I think the test is another tool to be used. If it had come up negative for me, I would have stayed on the gluten free diet. It just would have meant that I didn’t have celiac genes. But this particular test (and this is true for most if not all of the celiac genetic testing in the U.S. per my understanding) does not look at the gluten sensitivity genes. Even considering gluten sensitivity, one can test negative and still do much better without eating gluten. I often cite my husband who still eats gluten out, but eats gluten free at home for meals because everything I prepare is gluten free. After having sinus infections and viruses at least once a year, usually twice a year, my husband hasn’t had a sinus infection or an illness in 7 years. I think that says a lot. And, when he’s eaten almost completely gluten free in other countries because of the menu being served, his headaches have disappeared. I think everyone would probably do the testing if it was free, just out of curiosity. I’m not sure if any insurance companies (even mine) pay for the testing. I presume so, because mine paid a good portion of the Enterolab testing (after the fact, of course). Thanks so much for your input! I have to put a link up on our bakery’s FB page. Hi H.Peter–I agree … this type of testing is fascinating. A way to prevent developing a disease if you have the genes? Why, yes, I’ll take that! But, I’m not sure (as I was sharing in my replies to other comments) that someone who was gold standard celiac would necessarily fare worse than I did. I have MyCeliacID on my sidebar under the resource listings. I think it’s great that you are going to share it, too. 🙂 Thanks for taking the time to comment! Very interesting! I think you made the right choice going GF! Hi Heather–Thanks so much for your feedback! I admit the genetic stuff is a subject that I feel the least comfortable with, so I woud have appreciated seeing the data before I took the test, too. Knowledge really is power. And, I agree … I made the right choice with my doctor’s guidance. It truly didn’t seem like a choice. I was ill. Knowing that a change in my diet could fix the problem seemed too amazing to be true. Of course, it was overwhelming at first, too, but it didn’t take long to see what a gift I’d been given. It’s seven years later and while I’m older, I’m far healthier than I was then. That is a great idea to show your results for everyone to see too, Shirley. It helps people know what to expect if they decide to take the test! Great information for your readers, Shirley! Good job! And what you touch on is just part of the genetic equation (although the major part). There are also other gene regions that influence immune function and celiac disease (and gluten intolerance). It’s a complex mix of genetics and environmental factors. There are drug therapies in the works that will attempt to block the function of the HLA molecules in “presenting” the deamidated gluten (toxic gliadin fraction) peptide to the immune system. My opinion on that (for me personally)? Not that you asked. =) Those HLA genes have been around al lot longer than gluten, so I’m convinced they exist for a beneficial reason. What that is, I don’t know? But to block that genetic expression will probably cause problems elsewhere, so I’ll just stick to eating healthy, gluten-free foods. I’m not willing to take the chance when I can alter the celiac expression of those genes via lifestyle changes. We can use food and nutrients to alter the DQ2/DQ8 (and variants) gene expression. As far as genetically predisposed autoimmune diseases go, this is not so bad. I find the genetic piece of all this fascinating and have done lots of research on it. I even do presentations on how this plays out in families and who should be tested and tracked and so on. I had everyone in my family tested years ago. I have DQ2 (twice), my husband has DQ8. He wasn’t tested, I played Nancy Drew and figured it out from what my kids ended up with. Two of my kids have both DQ2 and DQ8. Everyone has some variant of the genes. And don’t forget the other gene regions scientists are just discovering. It’s definitely an interesting puzzle! Hi Melissa–Thanks, dear. 🙂 I know it’s a much bigger picture. That’s why I purposely said little as intro (I know … totally unlike me! LOL) and am asking for everyone’s input. I’m truly so glad you weighed in! As I’ve said before, this is my weakest area of knowledge . That’s why I have the disclaimer on my sidebar, “I am not a medical professional …” I’m so grateful for input from someone like you who is a medical professional with firsthand experience in the subject. Oh, I totally agree on celiac being one of the best genetic autoimmune conditions out there, so to speak. If folks can find out they have celiac, they can eat healthy, gluten-free foods as you said; take care of their bodies in other ways; and healthily and happily live to a ripe old age. That’s not true for most genetic diseases. Blocking the genetic expression … would not even consider it. Even with symptoms over the years, I found if one was treated and subsided for a while, a new one popped up and was screaming at me. Our body just keeps trying to tell us it needs help! I love that you played Nancy Drew and do presentations on this topic. A guest post would certainly be welcome from you! Think about it … I know … in your spare time, right? You mention the other gene regions that scientists are just discovering. Along those lines, I’ve read that in Europe many more genes are recognized for celiac. Do you know about those? Is that a case of the gluten sensitivity genes/alleles being included? Wow! An at home test! Very cool! I have been gluten free for 2 years and have been diagnosed as gluten intolerant. I was told the only way to find out if I actually have celiac was a bowel biopsy as mentioned above. I may try this test my left over HSA funds. Thanks for the post! Hi My Non Gluten Life–Welcome to gfe! This is the best test for someone to take who has been gluten free for a good while. However, note that the test wording says that a positive result does not mean you have celiac and seeing a doctor and biopsy were mentioned. Still, most folks consider having the celiac genes proof enough for them. And, as I said to others here, while I wouldn’t ever consider eating gluten again, this test is validation that I went down the right road. Shirley, VERY interesting. Thank you for sharing! Not long now ’til IFBC … can’t WAIT to meet you in person. Hi Lexie!–You’re welcome. MyCeliacID might be one of the most fascinating medical tests I’ve ever taken. I like seeing the info in black and white and seeing what all the possibilities were, not just mine. Well, at least the ones Prometheus tests for anyway. Hi Casey–Thanks so much for sharing your family’s story! I love hearing how quickly your son progressed after going gluten free. 🙂 I admire your and your husband’s decision to stand by your convictions and not put your son back on gluten. I’ve heard Dr. Ford address this topic several times and he says putting a child back on gluten when you know he reacts so is tantamount to child abuse. I think he’s right. Of course, the parent is simply following doctor’s advice most of the time, but it does give one pause. I think it’s just plain people abuse and one day a different protocol will be accepted with a gluten challenge as malpractice worthy. As my one friend says, for some of us, “a little bit of gluten is like a little bit of rat poison.” The piece of bread (or whatever the amount is currently) a day for the gluten challenge can put some folks at death’s door (if they can last the whole challenge period) and they can still test negative. The fact is, the endoscopy may or may not have shown celiac for your son. Dr. Ford would have biopsies performed on his pediatric patients, get negative results, and then over several years, literally see them develop celiac. He decided this just didn’t make sense. As he says, celiac is the only disease where we wait for end-stage damage to treat it. The blessing is that in most cases, the patients can recover without permanent damage once diagnosed. (Some of the exceptions are in children. See reply to Chelsey’s comment.) However, so many with celiac remain undiagnosed and so many more have non-celiac gluten issues. BTW, I had terrible withdrawal/detox symptoms for probably 6 weeks. I had to go on FMLA and just leave work at times and go home and go to bed. I was exhausted. Even driving a little over an hour to the doctor’s office each way required a day off from work and lots of rest aferwards. It took a while, but when I finally started seeing results, they were amazing. Dr. Hoggan says in his Top 20 Things About Gluten (on my sidebar) that the harder it is to give up gluten, the more you need to do it. I think the detox indicates it was pretty hard for both of us. I think it’s a very helpful test to take for those of who have gone gluten free, but a negative test would not change my mind about eating gf, because I know how good I feel AND the test does not look at genes for gluten sensitivity, only celiac. Casey–FYI … Update … I just looked in Dr. Green’s book re: gluten challenge and it’s 4 pieces of bread a day. See my reply to Kirsten. I had a blood test and it came back negative – but I’ve been eating gluten-free for 7 years like you. The doctor didn’t think it would come back positive. It’s great information, Shirley, and makes me think. It’s good information, especially for those of us who have never had a formal diagnosis but eat gluten-free for other reasons. Hi Amy–So glad you found this info helpful! 🙂 I do wonder how many of us who have gone gluten free without a celiac diagnosis, do in fact, have celiac genes. Dr. Rodney Ford estimates that 1 in 10 are gluten sensitive (compared to about 1 in 100 who have celiac). Dr. Fasano’s landmark study established the incidence rate of celiac by testing large groups of folks using the celiac blood test panel (without a follow-up biopsy by the way!). I wonder what the results of testing large groups with MyCeliacID would be. I’d love to see real data on both celiac and non-celiac gluten sensitivity readily available. Absolutely fascinating! Doesn’t it feel good after all these years of not being formally diagnosed to actually have it confirmed? Even though you knew gluten was a problem, it always feels good to have it backed up. I have never heard of this test before. If it was ‘t so expensive I would probably go and have it done. I never knew you could ‘grow’ into celiac disease. I was always under the assumption that you always had it, and your body could only grow into gluten intolerance (where it plainly says ‘enough is enough!’). For me, I haven’t been formally diagnosed (but I do know my body does not tolerate gluten). My memories of being sick while eating it ser e me well enough go not want to jump on the gluten train. I wouldn’t be living life if I was sick all the time would I?! Hi Chelsey–It is very interesting to see it all in black and white, isn’t it? As the test cautions, a positive diagnosis does not mean you have celiac. About 30% of folks in the U.S. have celiac genes, but only about 5% of the population develops celiac disease. (That data comes from the U of Chicago Celiac Dsiease Center.) But, that said, I do feel validated and I believe that far more folks have symptoms/illnesses caused by gluten than that 5%. Do they have celiac genes, or do they have genes that have been associated with gluten sensitivity (which tests in the U.S. do not test for per my understanding). Oh, yes, you can definitely “grow” into celiac disease as you say. As I was sharing with Casey in my response below, Dr. Rodney Ford, a pediatric gastroenterologist/allergist/nutritionist would literally watch children develop celiac over the years. He realized that once that happened, they often could not reverse some of the issues experienced, like short stature and learning disabilities. Similarly, there is a link between Type 1 diabetes and celiac. The national endocrinogists’ group in the U.S. just came out with guidance to test pediatric patients with Type 1 diabetes EVERY year for celiac. The statement said that case studies showed that celiac could show up 10 years or later after a Type 1 diabetes diagnosis. One of the keys required for celiac is a trigger. One has the genes and then say has an illness, gets pregnant, is exposed to an environmental toxin, etc. All those things (and many others) can “stir up” the immune system and activate celiac disease. Likewise, non-celiac gluten sensitivity/gluten intolerance can develop over time. A one-time “pass” on the Enterolab gluten stool sensitivity test does not mean that one is free and clear for life. You are very wise to eat gluten free … you are listening to your body, which is a wise thing to do and is like giving a gift to yourself. 🙂 Thanks so much for commenting! A timely post for me! I have just had confirmation that i tested positive for one of the genes but as I have been wheat free for over a year I can’t get an endoscopy. So now I’m wrestling with the notion of a ‘gluten challenge’. What does it entail? How much and for how long? The complicating factor in my case is that I seem to be a fructose malabsorber and that may be the reason for my symptoms. I find it frustrating not knowing whether celiac is an issue (I have only been wheat free, not being vigilant about excluding all gluten) – it’s reasonably common to have celiac along with fructose malabsorption. So should I behave as if I have celiac and see if that clears up the remainder of my symptoms or should I go the other route and do a challenge? I already know that it will cause a BIG increase of symptoms in me due to wheat containing fructans so I wouldn’t be able to attribute symptoms to gluten……?????? I plan to have all three children do the blood test for the genes, maybe I should wait to see what that turns up as all of them are still on a ‘normal’ diet but two of them have symptoms. Hi Kirsten–Sorry for the delay in replying! My many posts this week have me behind on replying to comments. 🙁 Gluten challenges are no picnic, that’s for sure. Frankly, I don’t know of anyone who has been off gluten for a year and then tested positive for celiac after a gluten challenge. The gluten challenges vary per doctor. I’ve heard a period of time from 3 weeks to 6 mos. However, I also know that studies have shown that it takes a year or two after someone starts cheating periodically for the effects to show up in blood testing. But, that said, Dr. Peter Green, who is considered to be one of the experts on celiac, states the following re: the gluten challenge in his book, Celiac Disease: A Hidden Epidemic (co-authored with Rory Jones)–“We arbitrarily use a standard set by Michael Marsh, M.D., from England, and a long-standing expert in celiac disease and say that a gluten challenge consists of eating about four slices of bread/day for a month. The thought is that most people will show an abnormal biopsy in that amount of time if they have a problem. If people are tolerating gluten well, we would prefer that they remain on gluten for at least three months before having a biopsy. This will reduce the chances that the biopsy results will not be definitive.” He goes on to say that for folks who are not willing to eat gluten again, genetic testing may be helpful. However, he says that genetic testing is more acceptable for eliminating celiac disease (i.e., if one does not have the genes) than establishing it. Great info! I did the Celiac ID test as well. Mine came back positive too (for the EXACT same “very high” risk level!) Thanks for sharing your results with all of us! =) I TOTALLY think you did the right thing!! This is so interesting Shirley! I have not tried this test, but I gave up gluten on my own almost 4 years ago. I think I’m still hesitant to try these tests because I’m scared they will tell me I have no problems with gluten, when I know full well I do… yet at the same time, I’m really interested to know what they would say! Thanks so much for sharing your experience! Hi Carrie–I know what you are saying. I can’t imagine you going back to gluten though, dear. This test would let you know if you have the celiac genes. If positive it simply shows that. If negative, your issue would be gluten sensitivity, but either way you know gluten is an issue for you. Still, I think we all usually want some type of black and white validation. It’s largely how we’ve been taught to view the world, and certainly medical testing. Hi Shirley! I just found your blog through another GF blog. I find this topic so interesting, because I want to have my older two children tested. My daughter (2 yrs. old) and I were just diagnosed in Feb/Mar of this year with Celiac. She saved my life in a way because I had no idea I had it, until she was diagnosed. She had all the typical gastro symptoms, failure to thrive (21 lbs at 27 months old), etc. Looking back I see things that now I am like “Oh yeah that could have been a symptom!” but my doctors never mentioned Celiac. Now I am 30 and have been diagnosed a “pre diabetic”, however, because my glucose levels aren’t getting better with a gf/low carb diet my doctor wants to test me for type 1 diabetes! UGH!! Anyway, we all went gluten free after being tested. My other two kids blood work came back fine. But I still don’t feel “reassured” by those tests, not after everything I have read. I really would like to have them genetically tested. Just so I know if we need to keep testing for Celiac or not. They show no symptoms, but then again neither did I. Thanks for sharing your expierence! Hi Tai–Welcome to gfe! 🙂 I think you’re wise to be considering additional testing for your children. Experts in non-celiac gluten intolerance and gluten sensitivity, like Dr. Rodney Ford, will tell you that it can take years of serious, even debilitating symptoms before a celiac blood panel is positive. Even then, the gold standard diagnosis requires a positive biopsy as well. Many can suffer long before those two things happen … IF they happen. Some of those foremost in the field of celiac/non-celiac gluten issues say that many will never develop celiac, but despite that can be extremely ill. I’ve seen individuals who fit that profile myself. I’m so sorry about the pre-diabetic diagnosis. (Although I consider the celiac diagnosis a gift of sorts.) I’ve dealt with the pre-diabetic concerns, too. Eating mostly real, unprocessed food as possible seems to be the key for me. Sort of a gf modification of the South Beach diet. Once one gives up other complicating foods/ingredients, you don’t really miss them, but getting there can be hard. And, just monitoring your glucose can educate you on which foods affect your glucose level. That can help a lot … makes you more intuitive on how you should eat. So glad my info helped! If you decide to do the MyCeliacID testing for you children, look for the $80 discount code on sites like celiac.com and livingwithout.com. I had the genetic test done through Enterolab which is a less expensive test ($149). I came back negative for either of the genes associated with celiac disease but I have two copies of the gene associated with gluten sensitivity which means both my parents have at least one gene. They also state that “Two copies also means there is an even stronger predisposition to gluten sensitivity than having one gene and the resultant immunologic gluten sensitivity may be more severe.” In addition had a salivary IgA test that came back with a level that was 4-5 times higher than normal. I think that makes for a pretty definitive diagnosis that I have non-celiac gluten sensitivity. Going gluten free sure made a difference in the number of migraines I get. I went from 2-3 per week to one every few months (often as the result of accidental gluten contamination). Hi Janet–Thanks for sharing your experience and personal info. I don’t think there can be enough sharing of our own individual stories. It’s validating to us and enlightening to others. I really appreciate you highlighting the info on the two copies of the gluten sensitivity gene, too. The genes for gluten sensitivity should not be ignored, although many times, only celiac genes are being identified in testing. We just have to emphasize to folks that lack of celiac genes does not mean lack of a gluten issue. Even 2 to 3% of biopsy-proven celiacs do NOT have the celiac genes. I’m so happy that your life has dramatically improved by going gluten free! I believe that anyone who has migraines should be gf.